Why stay in an apartment when you can hire Casa De Alhambra, a delightful luxury villa set in its own private garden for you, your family and your friends to enjoy? We invite you to rent this beautiful chalet with its outdoor swimming pool. It is ideal for your vacation on the unspoilt Costa de la Luz. This modern villa, near Chiclana de la Frontera, sleeps 6/8 people. It is set in an attractive, private garden with its own private swimming pool in the midst of quiet Stone Pine woodlands and yet is only 5 minutes (1½ Km) away from the shops and the white sands of the 8 km Barossa Beach, one of the finest, cleanest beaches in Europe and arguably the best in Spain. This fabulous beach fully justifies its Blue Flag status. Chiclana, just 10 minutes away, has something for everyone and if you are after that holiday bargain visit the busy market every Tuesday. Indulge yourself and rent the perfect place for your relaxing holiday - you deserve it! Ashley & Philip would like to welcome you to their holiday home in the Beautiful Costa De La Luz. We love this area. It is so unspoilt and relaxing. Our Spanish neighbours are so friendly and welcoming. Come and experience our little portion of the real Spain. This area is part of the truely authentic Spain and yet very accessible for all parts of Europe. Airports at Jerez, Seville, Gibraltar are all within 80 minutes drive and Malaga is only just over 2 hours away. Fabulous Pueblo Blancs such as Vejer, Benelup, Arcos and Medina Sidonia are all within a reasonable drive. For the children the water park at Puerta de Santa Maria is a must to visit. Casa Alhambra is set in semi-rural surroundings, less than a mile from the sea, with its own private pool for your exclusive use, in a very private walled garden. Nearby are several hotels that provide evening entertainment. If Golf is your game, this is the ideal place for you with 5 courses within 20 minutes drive, the nearest (Novo Sancti Petri) only 5 minutes away. None of these course are busy and most remain undiscovered. Nearby ventas provide excellent food at reasonable prices. This area has everything. En-suite bathroom to master bedroom with bath, shower over the bath, WC, bidet and wash basin. Family bathroom with bath, shower over the bath, WC, bidet and wash basin. Lounge with double sofa bed. Real fire, flat screen TV, DVD player, radio and satellite TV. Fully fitted kitchen including fridge/freezer, washing machine, dishwasher, oven, hob, toaster and microwave. English and German satellite channels. Note: UK TV channels are streamed via internet. The wonderful Andalucian climate allows golf to be enjoyed year round with 4 local courses within 15 mins of Casa Alhambra and a superb practice/training facility within 5 mins. Courses at Jerez, Puerta Santa Maria, Villa Nueva & Montenmedio are only 30 mins drive, whilst Costa Ballena, Arcos, Montecastillo and Sanlucar lie within an hour. 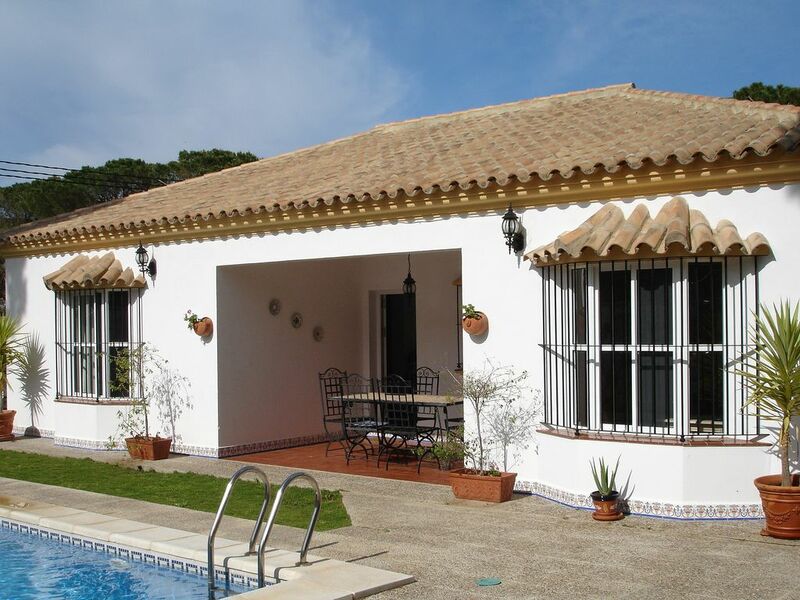 The courses of the Costa del Sol are also accessible with San Roque, Alcaidesa & Valderamma, completing this golfers paradise - Casa Alhambra is ideally situated to provide you with a variety & wealth of Championship standard courses. Whether an expert or beginner, you will find Andalusia the ideal place to play, thanks to its excellent climate and the quality and quantity of the courses. There is a broad range to suit all golfers. The variety of the courses, their facilities and their track record of many major championships held guarantee golfing quality. The pool is 8m X 4 m. Accessed by Roman steps the pool varies in depth from 1m to 1.75m. Use. the pool at your own risk, Children must be supervised at all times. The pool is not deep enough to dive. Notes on accommodation: Casa Alhambra is equipped with its own state-of-the-art, fully automated power supply so that you can rest assured that you are protected from the power cuts which are common in this area, allowing you to have a carefree, relaxing holiday. Each bedroom has air-conditioning, designed to cool the bedrooms only. The air conditioning is operated by a timer, excessive use of the air-conditioning will result in a fuel surcharge. The villa will be cleaned and prepared on the day of your arrival. Our representative will meet you with the keys to show you around and to arrange a time for your departure. WIFI Internet access is available. A fair use policy operates. Any problems should be referred to our representative. Issues arising due to actions by our clients resulting in a call out fee will be payable by our clients. The garden is maintained weekly and our agents may require reasonable access to maintain the villa. Outside: You will enjoy a private garden that is not overlooked, with a lawned area, barbecue and parking for two vehicles. A veranda provides alfresco dining. The garden has both sunny and shady spots where you can top up your tan or relax from the heat of the sun. An 8x4m swimming pool with Roman steps is available for your sole use. Local Ventas nearby allow you to enjoy a typical Spanish meal at very affordable prices. Cleaning / Towels / Linen / Maid service: Towels and bedlinen are provided. Linen is changed weekly. Beach towels are not provided. The villa is nicely situated to get to the best beaches in the Roche area in 20 minutes. Everything was at hand. Nice pool and shady garden, all walled so was not overlooked. Die Villa war sauber und geräumig. Da der Urlaub zum Golfen gedacht war, lag die Villa ideal! Fünf Plätze im unmittelbarer Nähe. Allerdings ist ein Fahrzeug angebracht. Alles in allem ein gelungener Urlaub!! The historic cities of Cadiz, Seville and Jerez are a 'must' visit. While the white Spanish pueblos such as Medina Sidonia, Vejer, Arcos and Conil, giving you a typical insight into Andalucian life. At Easter the parades of Semana Santa are unique and in May Jerez comes alive with the exciting Fiesta de Caballos. This home of flamenco, dresses up and parades in carriages and horseback and reverberates to the sound of flamenco music, dancing and of course drinking the Jerez sherry. In Seville, Isla Magica offers a great day out for the family and children . Take a drive to Gibraltar and do a bit of duty free shopping or for the more adventurous, have you ever been to North Africa? Cross the Straits of Hercules and take a day trip to exotic Tangier, in Morocco. Alternatively, visit Ceuta, the pretty Spanish enclave on the North African coast. Both Tangier and Ceuta are a short cruise from Tarifa or Algeciras less than a one hour drive from Casa De Alhambra. Why not visit another continent! At Casa Alhambra you are only 5 minutes drive (1.5km) away from the shops and the white sands of the 8 km Barossa Beach, one of the finest, cleanest beaches in Europe and arguably the best in Spain. This beach offers both quiet solitude and family enjoyment along the esplanade of Chiclana Costa. Go to Sancti Petri for water sports or a boat trip around Sancti Petri Island. Drive a little further down the coast and enjoy the beaches of El Palmar, Bolonia and Tarifa or visit Cape Trafalgar. Jerez: 40 minutes drive Jerez airport is the nearest airport. The airport is small and relatively quick to pass through. Gibraltar: 80 minutes drive. Car hire collection is usually a short walk over the border in La Linea. Malaga 160 minutes drive. The motorway from Malaga is quick and for much of the journey under used. There is a toll charge on the Malaga - Marbella/Estepona section. Sancti Petri for water sports: 6km. Chiclana de la Fronters: 5km. Vejer de la Frontera: 31km. There are several supermarkets in Chiclana and a modern shoppng centre at La Bahia in San Fernando. Nearby is a small shopping centre, the Novo Centre, which has a small super market, pharmacy and several shops. Within walking distance are two traditional Ventas. Venta Lopez just 300m from the villa provides delicious meals and tapas at very reasonable prices. Booking Notes: A 25% deposit is payable on booking. Final payment is due 8 wks before your holiday starts. For late bookings payment is in full. Cot reservation fee is £20 pwk. On receipt of your final payment we will send directions & contact details for our representative who will meet you at the villa to show you around & provide keys. On arriving at the airport we ask you to text him so that he knows when you will arrive. Please notify him if your plans change on the way. Changeover Day: Change over day is flexible but for August and July we prefer Saturday or Sunday. The villa is made available for you from 6pm on arrival day until 10 am on the day of departure. This may vary by arrangement with our representative.